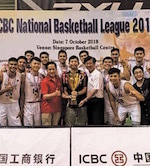 Sin Kee and Xin Hua SC enter the Grand Final of the NBL Qualifying Round. The teams overcame their opponents in the semifinal clashes and will face each other on 17 December at 6.30 pm. Sin Kee beat Nanyang 84:62 dominating the majority of the game. Xin Hua SC meanwhile overcame Hoops Factory 69-61. The latter tried their best and looked great in the court, however Xin Hua SC proved their ambitions for the top places with an 8-point win.